Few can say they’ve left planet Earth. Jeff Williams has done it three times. After a lengthy military career, Colonel Jeffrey N. Williams was chosen from among a handful of candidates to become an astronaut for NASA and work on the International Space Station (ISS). He has been a longtime supporter of ICR and recently visited our headquarters for the first time, graciously allowing us an interview. ICR: Why do you support creation ministries like ICR? JW: My affinity for organizations like ICR has to do with what I see as [their] commitment to the truth of Scripture and trying to strengthen, in the minds of Christians, a confidence in the Scripture. And, of course, your interest is in the creation account, and the Flood and the early chapters of Genesis, and that science is compatible with the biblical account. 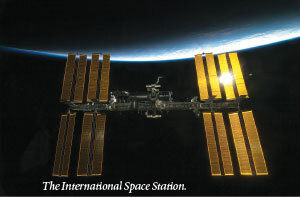 ICR: Are you the only Christian aboard the ISS? JW: There is a generalization that anyone who worked for NASA, or an organization like that, would naturally be an atheist, but that’s not true. There are many Christians in the organization, many Christians in other government agencies—there are Christians everywhere. The work that I do and have done through my military career and with NASA has been perfectly compatible with the Scriptures, and I’ve lived out my life as a Christian, and there’s been no issue there. ICR: Why are you a creationist? JW: I came to Christ in the late ’80s. I’ve studied the Scriptures since 1988. I didn’t want to jump on a bandwagon; I didn’t just want to be a follower of a religious organization. I wanted to understand what the faith was, and all of my life, since 1988, every day I study the Scriptures to try to understand [them], and one of the things that I’ve found is the complete internal consistency within the overall Scriptures and that the truth of Scripture is affirmed by every other piece of extra-biblical evidence. ICR: So you don’t find any conflict between science and your belief in Scripture? JW: I don’t find a conflict with true science—genuine science with integrity—and the Scriptures. I have found that in all cases where there is a conflict, it’s not a conflict with the science, it’s a conflict with the presupposition going in. So it’s more of a philosophical thing. If you study those things, philosophy, science, and religion have always intersected. The lines dividing them have never been clear, and they often get blurred. If somebody perceives science to be in conflict with, for example, the early chapters of Genesis, it’s not the science, it’s the presupposition that goes into it. If you have a presupposition that excludes the possibility of a god, that excludes the possibility of supernatural acts, and that [believes] everything has to be explained just with natural processes, then you’ve basically limited what you can let the objective observation of science tell you. That’s where the issue comes in. I presuppose God. And I presuppose the truth of the Scripture. ICR: So, before you even look at the data, you have in mind that miracles could have happened? JW: I assume a creator. And it’s not just the chance of miracles, the chance of supernatural acts, it’s the truth that He is the Creator, He accomplished His creation as He has revealed to us in the Scripture, in Genesis 1 and 2, and reaffirmed throughout the rest of the Bible. ICR: What’s the most fascinating thing you’ve seen out in space? JW: The biggest attraction outside isn’t deep space—it’s the earth. Everyone on the station is fascinated with the earth. You never get tired of viewing the earth. When I look out the window at the earth (and I’ve accumulated almost a year in orbit, and we orbit every 90 minutes—sixteen orbits a day), I see the entire globe—except for the poles—over time. And over weeks and months you see the seasons go by. You see all the details and all the different lighting conditions. It’s an endless variety of the observations of the details on Earth. When you cross the Middle East, from orbit, and you can see the entire biblical history in one vantage point and the entire geography that Christ came and lived on as a man over 2,000 years ago, that gives deep and profound meaning to that view. 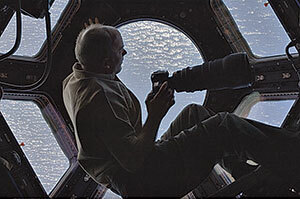 ICR: Can you see any evidence of the Flood from the ISS? ICR: How has your walk with the Lord and your study of Scripture impacted your family life? JW: It’s had a tremendous impact. We went through a family and marriage crisis in the late ’80s and out of that came to faith in Christ and the truth in Scripture. We rebuilt our marriage and family from that point on and made it a priority, and it completely changed our lives and our priorities in life. It has completely transformed us—so it has become central. My first priority is to honor Christ, my second is as a husband. You can only fulfill your duties as a husband if you are submitted to Christ. ICR: What are some personal, spiritual lessons you may have encountered where your walk with Christ—your study of Scripture—has intersected with some of these views of Earth from space and had an impact on your spiritual life? JW: In a broad sense, there is a continuous impact when you have, in the back of your mind, the truth of the Creator with His infinite wisdom in the design, order, and the purpose and plan in the details of His creation. ICR: Do you have any good stories about life on the ISS? JW: One story is my favorite—it happened in May of 2006. I was six weeks into a six-month stay, kind of having a down day, and I confessed this to my wife, Anna-Marie. I talk with her each day while in space. It was late morning, and I floated over a window where I typically had a camera staged and saw this snow-covered peak poking through the clouds and grabbed a picture. They were the Aleutian Islands, a series of beautiful snow-covered peaks. Something looked strange about one of them. I went back and reframed the picture and realized it was an erupting volcano. By the plume, I knew it was a brand-new eruption. I was very animated about this, called NASA, and sent the pictures. We called the Alaskan Observatory from the ISS and told them I witnessed this volcano erupting, and they thought it was a prank. 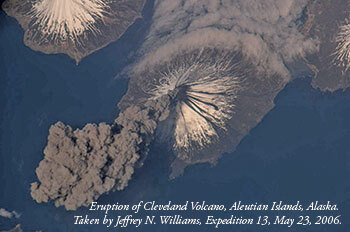 [It was the island volcano named Cleveland.] After 90 minutes, we flew over the volcano again, and it had already stopped by then. In a very special way, it was the Lord’s provision to raise me out of my slump. More specifically—from a Christian point of view—it was a direct answer to Anna-Marie’s prayer that the Lord would bring something into my day. He takes care of us continually in the little things—and I’ve learned over the years to look for the little things. I have a great love for the study of the providence of God, which is evident throughout Scripture—and if we look for it, it’s in our lives. He orchestrates the details of our lives. ICR: Is there anything else you’d like to share with ICR readers? JW: I appreciate the ministry of ICR. I appreciate the ministry of any organization and individuals who are dedicated to reinforcing the truth of Scripture and encouraging believers to have confidence in the Bible, that it is the truth of God, that it does contain the wisdom of God. He has revealed Himself as Creator, as the Provider, and as our Redeemer in a very explicit way that can be understood and can be trusted. * A West Point graduate, Colonel Jeffrey N. Williams served 27 years active duty in the U.S. Army as an Army aviator and experimental test pilot. He has an M.S. in Aeronautical Engineering from the U.S. Naval Postgraduate School and an M.A. in National Security and Strategic Studies from the U.S. Naval War College. 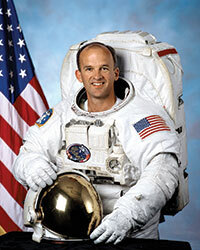 Williams was selected for the NASA Astronaut Class of 1996 and has flown 3 space flights to the International Space Station, accumulating about a year in space. He is currently preparing for his fourth space flight, planned for six months, beginning in March 2016. Cite this article: Staff Writer. 2015. Above All the Earth. Acts & Facts. 44 (3).